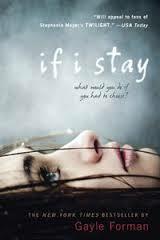 In the book If I Stay by Gayle Forman, the main character, a seventeen year old cellist named Mia, gets into a huge car crash. After the crash, Mia loses her parents and her brother Teddy. She is now in a coma, however her mind is somehow outside her body, giving her the power to see everything as a ‘ghost’. While Mia is in her coma, she walks around the hospital watching everything that is happening around her. Most of her family is there, and so is her best friend Kim. Throughout the story, Mia remembers all the great events that happened in her life, and she wonders if she should stay. In one of Mia’s more important memories, she tries to remember what happened on New Year’s Day. Her parents had a barbeque and invited all of their friends over. Mia invited Kim and her boyfriend Adam. This day was a very important day for Mia because as a cello player, she always thought that the cello was a solo instrument. That night, when Mia’s dad and Adam made her play with them, she learned that the cello is not actually a solo instrument. This made New Year’s Day one of the best days of her life. Her life was perfect, so choosing to stay or to leave should be easy for her. However she still can not take in the fact that if she does decide to stay, she would have to stay without her parents and Teddy. When I first started reading this book, I thought that it would be a little challenging, but at the end, it turned out that it wasn’t as hard to read as I thought it was going to be. Since it is written in first person, it displays all of Mia’s emotions through her perspective. How she is nervous during her cello concerts, how happy she felt on New Year’s Day, and how upsetting it was for her when she found out that her parents and Teddy were dead. Even though this book is very sad, it is also very inspirational. The author writes this book so that Mia has a very good past, and then in just a snap of a finger, all of it is gone. I like this book because it conveys to the reader that anything inside this book could actually happen to someone in real life. This book has a great variety of different vocabulary words that I think could be very useful in real life. After reading this book, I would rate it nine out of ten stars, and I would recommend this book for students in eighth grade and older. 1. Who is the main character’s father? 1a. Mia’s father is a middle school teacher who used to be in his own rock band. 2. What does Mia hide under her bed and how does she feel about it? 2a. Mia hides a Pile of classical records under her bed and she is too embarrassed to tell anyone but Adam. 3.Why is Mia in the hospital? 4. What state is Mia in right now? 4a. Mia is in a coma, however she can everything as if she is a ghost. 5. How does Kim feel when she sees Mia in the hospital? 5a. Kim is very upset and is trying to hold back her tears while she goes downstairs of the hospital to pray for Mia. 6. What does Mia dress up as for Halloween and why? 7. How did Adam and Kim get into the ICU? 8. What happened to Mia at music camp? 9. What did the nurse mean when she said that it was Mia’s choice to stay or to go? 9a. The nurse meant that Mia could choose to die or choose to live. 10. Why did Mia want to quit the cello? 10a. Mia wanted to quit the cello because she wanted a fresh start in high school and if she quit she could also learn to play other instruments like the guitar or drums. She also wouldn’t be known as the ‘dorky’ girl. 11. Why did Mia’s dad quit his band? 11a. Because he felt that he was ready to move on and become a teacher to take care of his family. 12. What did Mia’s grandfather say to her in the hospital? 13. Did Mia get into Juilliard? in, should knew she would accept and go to Juilliard. 14. What happened on New Year’s day? 14a. Mia’s family had a lot of people over including adam and they had a barbeque in their backyard. the end of the day, Mia learned that cello is not a solo instrument. 15. What did Adam do to encourage Mia to stay? 15a. He played her Yo-Yo Ma’s music and reminded her that everyone wants her to stay and that her life is worth living.